I came across this plant while on holiday, there was a row of them planted along the path. I wanted to see what it was so I took a look at the long, strap leaves that emerged from the ground (no stem, no branches) and immediately thought, “Amaryllis”. Although there were a lot of these plants, only a few were in flower and aren’t they unusual? The petals are the long, thin white ribbons while the stamens are arranged in a star-burst and are part of some sort of open cup or trumpet. The stigma is green and rises high above the flower. The colour is a really pure white but it didn’t seem to be scented. I give it top marks for the “exotic” look. 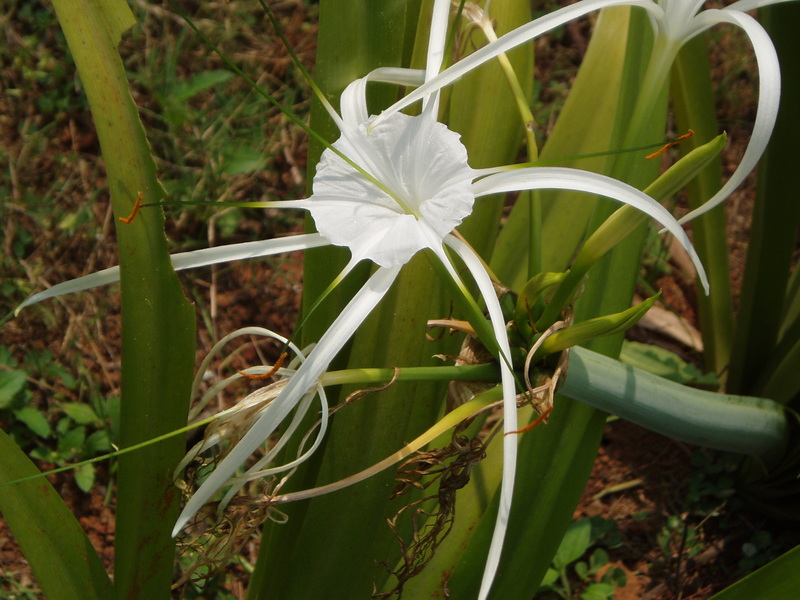 The plant is a member of the Amaryllis family (Amaryllidaceae) and is called Hymenocallis. There are many types of Hymenocallis (about 70 — 80) and from comparing photos, this one is probably littoralis.